I just thought I would update. On Tuesday I had two appointments, one at Essex County in Colchester to fit my mask and go on the simulator and then an appointment at Colchester General for a CT scan. Both appointments went fine, the first one just involved having the mask put on and then making adjustments (I don't think they needed to do much) and then I had to wait a while before going in to the simulator room to mark the mask (so they know where to aim the radiotherapy stuff at) - I had to lay still with the mask on for about 10/15 minutes. I wasn't really looking forward to it but it wasn't as bad I expected, it just feels a little bit tight but it's meant to be so I don't move!! I think it helped that I could actually open my eyes this time, even though the mask doesn't have holes where my eyes are I can still open them - it just looks like I'm looking through frosted glass, haha. After that was done the radiographer came in to the room and asked if I minded if she tattooed me lol. It's just a tiny tiny dot on my chest, so they know where the mask is meant to b e lined up. It's permanant by the way, but I'm really not bothered because it really is so small people would just think it's a freckle or something lol. If, of course, have a picture of it!! It's (obviously) in the middle of the two arrows lol. After that appointment we headed to the general hospital, didn't have to wait too long. I got taken in to the room and layed on the bed, had the mask put on and then had the CT scan. Think it went on for about 10 minutes...I just try and concentrate on my breathing when I'm laying there. Because it's so tight around my throat it makes me feel like I can't swallow (which always makes me think about it and then panic) - but, I actually can swallow lol. That was over and done with and then we headed home! On Wednesday I shaved my head. Well, I didn't do it. My friends Vix and Jodie did. I knew that I had to do it at some point and had been thinking about it for a few days and just decided that I needed to get it over and done with. Firstly, we cut my ponytail off and left it on the light shade in the living room so my Mum saw it when she walked in LOL I'm weird, I know. Then we went in to the kitchen and did it. My roots are blonde - so I wonder if it'll all grow back blonde. Wouldn't that be strange? Even though I was amost bald anyway it's still weird when I look at myself in the mirror - it's going to take some getting used to!! I'm excited to see how it grows back, I really can not wait. Let's hope it grows quickly!! Today my speech therapist, Hilary came over. She was here for about an hour and a half, I think that was mainly because I don't shut up lol. We're not going to properly work on my voice just yet because people usually lose their voices when they have radiotherapy but I have exercises to do every day (little and often) - the tumour is stopping my voice from coming out properly, it's hard to explain it. Hilary will also be the person to talk to if I can't swallow properly and everything and she said that even if it really hurts to swallow, to still try and do it as often as possile otherwise my neck can stiffen and then when I'm better from the radiotherapy I wont remember how to swallow properly. Even if it means just taking tiny sips of water a few times day, it's better than doing nothing at all. BUT, I might be fine. Erm...I'm trying to think of everything else we discussed. I'm so rubbish - I always forget what is said!! Hilary brought loads of things with her and in the end I asked what they were and basically, one was a swallow test kit. But she said she saw me drink my tea and can see it's fine lol. And then another one was an amplifier! But, I said that I didn't really need it because (most) people can hear me clearly even if I am whispering. It's just on the phone that some people can't hear me but most people can now. I think I've learnt to whisper pretty loudly seeing as I've been doing it since October!! I mentioned about my voice coming back around Christmas and I said that ideally, I should of just used it all the time even if it didn't come out that great it would of kept my vocal chords going and everything. But, she said not to beat myself up about it. A little bit of voice came out today and Hilary said she was impressed, which is good!! It's pretty hard to write down on paper what exercies I have to do...one of them I have to try and say "eh oh" like a tellytubby haha. I have a few others...she said to just pick randomly which ones to do. And if I get any pain at all, to stop straight away. I mentioned it was my Birthday in 5 months today (yay!!) and she said that hopefully I'll have my voice by then!! I asked her if my voice will ever be 'normal' again, she answered "What's normal?" Lol. Which is totally true...but I went on to say something like "If I was in a room and we all had to speak, would someone notice that my voice was different from the others?" She said that she couldn't answer that question but my vocal chords will probably have some scarring from the tumour so it might sound a bit hoarse. But she has seen people whose voices have returned to normal. So, it's not really a question that can be answered. But, I'm prepared for it to be different...I'm used to having a different voice anyway. At least now I can come back with the reason WHY where as before I thought that was just the way my voice was. It's weird that before my voice was the only thing I ever worried about and now, it's not really something that bothers me too much. If it's different then I'm sure I'll (and other people) will get over it and I'll just be grateful to have any voice. 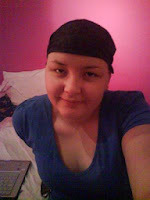 I don't think I have anything else to update on, start radiotherapy in 11 days - I'm not nervous about it or anything. Kind of exciting to get it started because it means it'll be over sooner if that makes sense lol. I'm going to be crossing the days off after each treatment and I'm sure it'll fly by. I was diagnosed 3 months ago on Wednesday and that has flown by. Feels like it was last week or something. Oh, one more thing. My hearing has been weird lately - one of the side effects of one of the chemo drugs (cisplatin) is (sometimes permanant) hearing loss and I've been getting ringing in my ears for a few weeks but didn't really link it to side effects of the chemo. I also noticed that when I have ear phones in, the right ear phone sounds louder than the left. So, I need to mention it to one of the chemo nurses. I'm not sure when though because I don't have my next lot of chemotherapy until the 25th...but I could get my Mum to phone Lisa and see what she thinks. For everybody who lives in Essex, listen to BBC Essex tomorrow morning (frequency is 95.3 FM) at 9:15am. My Uncle Pete and I are going there tomorrow to be interviewed about the charity stuff we're doing. Well, Pete's doing the talking. I'll just sit there and listen!! Mum was meant to go but she's not well at the moment (get well soon Mum, love you!) so she can't come. Sometime soon I'll post an entry all about the charity event and everything. Okay, that really is everything I had to say. I'll post this now before I think of something else and bore you all!! ..I retrieved your cut-off pony tail from the ceiling light! Made me laugh when I saw it hanging there when I walked through the door! You originally had a beautiful head of hair..now you have a beautiful head...I'm really excited for you that your hair will be growing back soon. I wonder if it will be blonde? The last time your hair was blonde was when you were two..and it was curly also! It'll be weird if it came back like that!! Awwww. Well, my dear Daughter, I am in awe of you. You have tremendous strength - and take everything in your stride; one day at a time - and you are coping fantastically. I await the day when your hospital visits are over, that you can wave goodbye to this journey - and do all the things you should be doing - and you will. You car awaits its owner.. So you got a tatto AND shaved your head this week?! Now some would say you seem to be going through the angry rebellious teen stage! :-p I reckon after all this is over you should make the dot into a flower or a star or something happy and something a bit bigger than a dot lol. I'm not a big fan of tattoos but yours would be an exception! If you're blonde I will be mega jealous, I spend a fortune dyeing my hair! And Leah will love it LOL you can be blondies together! My name is Linda, and I'm a friend of your Mom's through AOL journals. I am absolutely humbled by your strength, courage, and grace....you have now become my very own personal Hero. If you don't mind, I'd like to come along with you on the rest of your journey and cheer you on as you cross the finish line....and you will!!! I love this quote, although I'm not sure where it came from, and I thought of it when starting to write you. Comfort on difficult days, smiles when sadness intrudes, rainbows to follow the clouds, laughter to kiss your lips, sunsets to warm your heart, hugs when spirits sag, beauty for your eyes to see, friendships to brighten your being, faith so that you can believe, confidence for when you doubt, courage to know yourself, patience to accept the truth, Love to complete your life." I wish all that for you, Hayley, and more! P.S........I heard we have something in common, I love Pooh Bear! I hope your hearing ends up being okay...ears can be weird though!! Just wanted to let you know I'm thinking of you. I so admire your courage and strength. It must have been hard to shave off your hair but it will be growing back very soon. A blondie huh???? Whatever colour just remember you are beautiful both inside and out and nothing will ever change that. I hope you get your hearing sorted out soon. Too many loud Spice Girl concerts lol. Well lots of hugs and kisses from across the pond and I'll be praying for you on Friday. it through all this with flying colours. =] I have no doubt. It must be weird to think you might have blonde hair when it grows back when you are used to having dark hair!